I'm really excited that I bit the bullet a few weeks ago and tried my hand at poetry again. I have always loved poetry, especially in college. When I was in school and first met my left-brain, practical, engineering/business-type husband, and told him I was majoring in English, his response was an curious, honest (and slightly befuddled), "So...are you going to be a poet?" I laughed. Because, sure, I would've loved to be a Poet with a capital P, but I tend to be realistic and thought it was safer to make a living teaching English for a while instead (you know the old saying, 'people who can't do, teach!'). 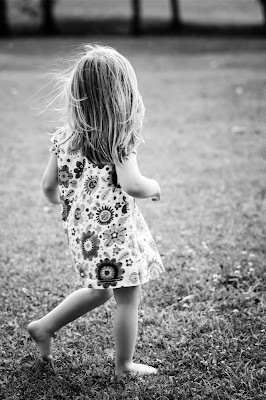 This photo of my daughter was taken by my talented friend Michele at mQn Photography. It captures her true butterfly-like essence! Alas! Maybe I've become just a bit of a poet after all, because I had my first one published on the venerable Mamalode last week-- my first choice publication for the piece I wrote about my daughter. Mamalode's theme for the month of October is beauty. I didn't want to write another essay about how physically beautiful my child is-- while those types of essays are fine, and can be well-done, they're also everywhere. What I really wanted was to find a non-cliche way to convey that it is my daughter's inner beauty-- her soul-- that I think radiates and defines her outer beauty. Yes, I want her to feel confident in her appearance and accept any 'imperfections,' but what I also hope for her is that she can feel good about who she is within. See what you think! Here's the link. Dreamy ,airy and free. That is how I found your poem!! Your little girl will forever be able to trust her little wings! Because her mamma is a butterfly too. And yes, we are always rearranging our molecules. You are 'still becoming' what you are meant to be!! To this poem and the next and the next- ENCORE!! Thank you so much!! She is like a little butterfly-- that's the perfect comparison!